May 16 SMSU Student Center, Marshall, 9:00 a.m.
May 21 Washington County Historic Courthouse, Stillwater, 9:00 a.m.
World War I Centennial begins in 2014 (2017 for the United States). What is your organization doing to get ready? What are your thoughts on the most recent version of Minnesota-bred F. Scott Fitzgerald's The Great Gatsby? Brucemore, Cedar Rapids IA, seeks Manager of Interpretation & Collections. Deadline: May 31, 2013. Ames Historical Society, Ames IA, seeks Collections Manager. Deadline: May 31, 2013. African American Museum of Iowa, Cedar Rapids IA, seeks Curator. Deadline: May 31, 2013. Northfield Historical Society, Northfield MN, will host two events the evening of May 16, 2013. Beginning at 6 p.m. the society will honor their 2012 Volunteers of the Year. The new exhibit "Northfield Eats" will also be open to the public. Call 507-645-9268 for more information. Dakota County Historical Society, South St. Paul MN, is pleased to host author Bruce Kohn on his new book "Dakota Child, Governor's Daughter." Talk and book signing Thursday May 16, 2013, 7 p.m. Call 651-552-7548 for more information. Join Hamline Midway History Corps, St. Paul MN, May 18, 2013, 2-4 p.m., for their next monthly meeting at Ginkgo Coffeehouse. Washington County Historical Society, Stillwater MN, announces that the St. Croix Base Ball Club begins its season of vintage base ball at Lake St. Croix Beach MN, Pettit Park against the Afton Red Socks, Sunday May 19, 2013, 2 p.m. Call 651-439-5956 for more information. Lac Qui Parle County Museum holds its spring Open House, Sunday May 19, 2013, 2 p.m. Guest speakers will be Jill A. and Deane Johnson, who published "Little Minnesota: 100 Towns Around 100." Carlton County Historical Society, Cloquet MN, announces the next Movies at the Museum, Friday May 24, 2013, 1 p.m. Featured movie will be "The Golden 20s" (part two). Call 218-879-1938 for more information. Nicollet County Historical Society, St. Peter MN, will hold their annual plant sale fundraiser for the Cox House, Saturday May 25, 2013, 8:30 a.m. to 2 p.m., at the Treaty Site History Center. Contact Susan Carlin, 507-382-5162, or Richard Tostenson, 507-934-1105, for more information. Greater Mankato Tweed Ride begins at the Historic R.D. Hubbard House Park, Saturday May 25, 2013. This is a group bicycle ride through the greater Mankato area, hosted by Greater Mankato Bike/Walk Advocates. Classic vintage bikes and early 20th century cycling attire encouraged. Call Shelley, 507-345-5566, for more information. Cokato Museum and Historical Society, Cokato MN, will host its annual Memorial Day Open House on Monday May 27, 2013, 9 a.m. to noon. Contact the museum, 320-286-2427, for more information. Boy in Blue Memorial Project, Mankato MN, hosts "Decoration Day in Lincoln Park," an 1895 Decoration Day Reenactment, Thursday May 30, 2013, 6-8 p.m. Contact Julie for more information. Anoka County Historical Society, Anoka MN, opens the exhibit "All for the Union: Anoka County Faces the Civil War," May 30, 2013, 7 p.m. Call 763-421-0600 for more information. Stearns History Museum, St. Cloud MN, will hold a "We Love Our Soldiers (present and past) Event," Saturday June 1, 2013, 10 a.m. to noon. Come enjoy tours of the museum, root beer floats, and scavenger hunt. Call 320-253-8424 for more information. American Association for State and Local History is planning a webinar to discuss how public history and museum studies programs can use the StEPs program (Standards and Excellence Program for History Organizations). If you have incorporated StEPs into your graduate or undergraduate curriculum, or are interested in the webinar when it is available, contact Cherie Cook, 573-893-5164. 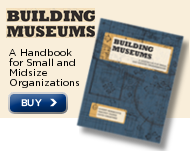 AASLH announces that for the first time ever, individual volumes of the Small Museum Toolkit are available for purchase separately in paperback or hardback. Order online or call 1-800-462-6420. Stearns History Museum, St. Cloud MN, will honor three Stearns County families in June by designating their farms Century Farms. This award recognizes and honors farm families that have owned at least 50 acres continuously for 100 or more years. For more information, contact John Decker, 320-253-2484. Hastings Prescott Area Arts Council (HPAAC) and Artspace invite interested people to participate in an open community meeting on Wednesday June 5, 2013, 7 p.m., Historic Hastings Court House (Hastings City Hall) Council Chambers. The groups seek public input on constructing a multi-use community space for artists and the entire community. Comments can also be sent to the HPAAC. The governor of Iowa has proclaimed June 9-16, 2013 as Iowa Museum Week. Daniel Hartman has been named Interim Director of Glensheen Historic Estate. Check out MissionFish, a new way for donors to contribute to their favorite causes. This might be another avenue for historical organizations to use for their fundraising efforts. Denmark Township Historical Society, Washington County MN, met at Valley School on May 8, 2013 to celebrate making the final payment on the purchase contract to save the 1852 school. Since buying the school in January 2012, they raised $80,000 to complete payment. Next steps include plans to have the building listed in the National Register of Historic Places and fundraise for restoration. Contact Wayne Boyd or Bob and Mavis Voigt for more information. Pictured: Wayne Boyd, Lyla Davies, Jean Boyd, Lauren Cran. Photo courtesy of Denmark Township Historical Society. Minnesota History Along the Highways, compiled by Sarah P. Rubenstein. May is Minnesota Museums Month!